In this sequel to the cult comedy Goon (2011), the Halifax Highlanders are reaping the benefits of the NHL lockout. As a consequence of the strike, new professional players and old favorites join forces on the bench to bring rough, foul-mouthed hockey back to the rink. 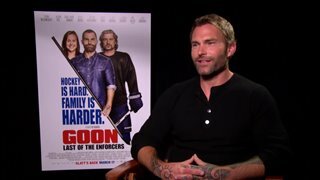 Married with a baby on the way and a body that shouldn't weather another hit, aggressive and highly-skilled brawler Doug "The Thug" Glatt (Seann William Scott) is ready to turn in his skates. But when he learns that his arch rival has been named Captain of the Highlanders and that new ownership threatens to destroy the team, he's lured back to the sport. He laces up and returns to the ice to keep his treasured team together. "Awesome movie. Don't hate because of vulgar language! It's hockey. What did u expect, guys in dresses having tea party!! 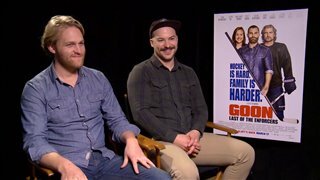 Awesome job jay, you always make me laugh and now with this second goon movie, puts the cream on the cake!!! Rock on jay, goon rocks!!!! Wooooo"
"The hockey scenes were good and quite funny at times. Also having to choose between hockey and family priorities was well done. 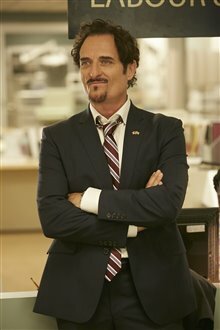 However, far too much crude language, sexual references, and using God's name in vain which ruined the show for me. The amount of blood splattered in the fighting was also way over the top. 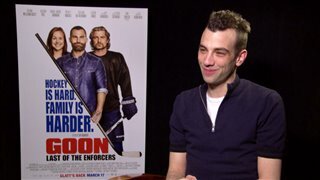 Jay Baruchel's character was vulgar and unnecessary. Could have been a much better show. Face Off from the early '70 s a far superior hockey film. Hope this is the last of the Goon films after this one." "I watched this movie. I did not hear one laugh throughout the time I spent watching it. The auditorium had people in it but they were absolutely silent"